Height adjustable simple pneumatic controls let you raise or lower your seat. 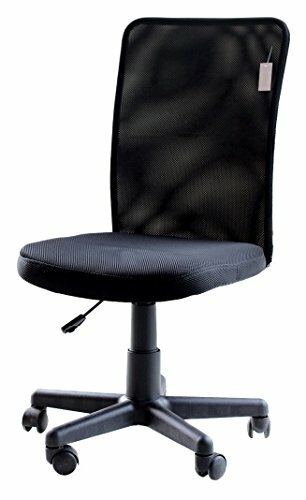 The adjustable task chair helps promote an ergonomically correct seated position, which is important when at your desk or in front of the computer for long stretches of time. To raise the seat, lean forward to remove your weight from the chair, then pull up on the control handle. To lower the seat, stay seated and pull up on the control handle until you're where you want to be. Mesh-covered seat and chair back mesh covers both the 2-inch- thick padded seat of the chair, as well as the back of the chair. In addition to lower-back support and border detailing, the gently curved back of the chair provides mesh-only sections for enhanced breathability.360-degree swivel & smooth-rolling casters offering a versatile range of motion, the computer chair swivels 360 degrees formulate-tasking convenience, while its durable casters allow for smooth-rolling mobility from one work space to another.